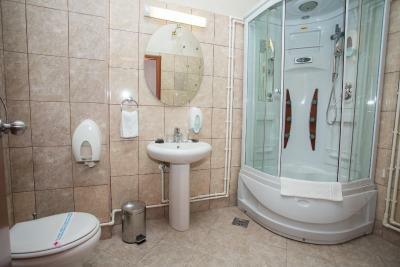 Lock in a great price for Sin-Kom Hotel Garni – rated 9.1 by recent guests! The hotel is in the center of the city. It's quiet. Have free parking. Very polite staff. Room and bath were big enough and clean. Very good espresso for breakfast. The hotel is good value for money. 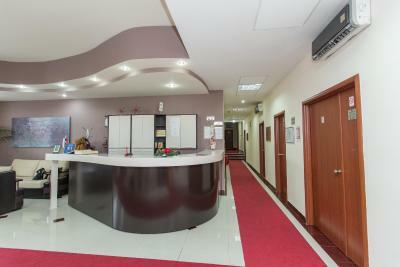 Located close to the center of Pirot. 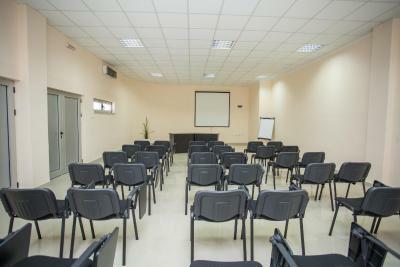 Large room, very clean, with comfortable chairs, excellent bathroom. Free parking in the backyard. Good Wifi signal strength. The staff was very welcoming and responsive. The room was clean and comfortable. Parking was convenient and free. It is close to downtown. 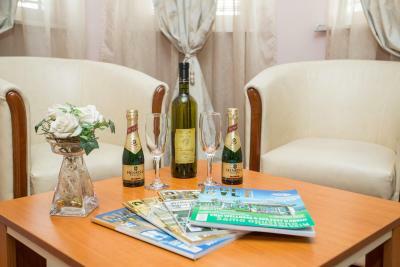 It was really comfortable and clean, the staff was really kind and we get the late check out cause we were in Pirot for wedding celebration. Excellent position / very friendly & professional staff. Nice hotel, clean sheets, welcome staff. Close to the market, where is full of small bakeries and meat stores. Free parking is available. Really a good breakfast. Better than many hotels we have been. Convenient place. Nearby is the Museum connected with some great Serbian films and a cool krachma. 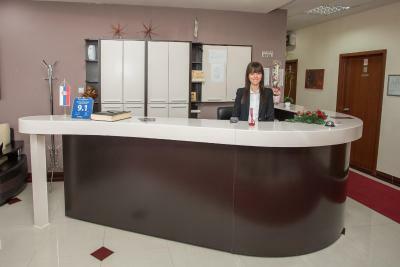 Very polite and helping staff, extremely clean rooms and hotel! Great location! All was perfect! Will be back again for sure! Whilst this hotel doesn't look like much on the outside, the staff and people have really made it an extremely friendly, bright and amazing hotel. 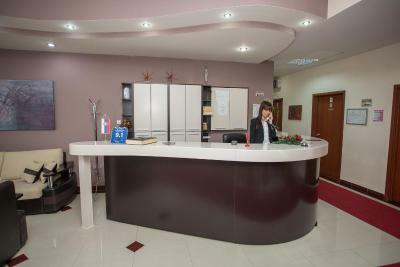 Many thanks to the staff at the front-desk for all the professionalism and hospitality they've shown us. 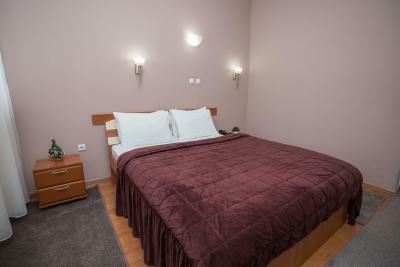 Sin-Kom Hotel Garni This rating is a reflection of how the property compares to the industry standard when it comes to price, facilities and services available. It's based on a self-evaluation by the property. Use this rating to help choose your stay! 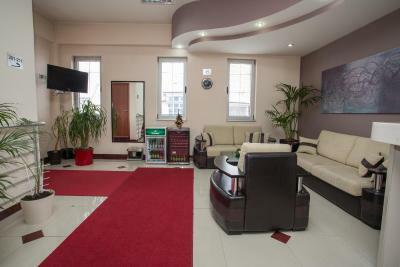 Sin-Kom Hotel, only a 5-minute walk from the center of Pirot and 1,950 feet from the Main Train Station, offers rooms with free Wi-Fi. It features a 24-hour front desk and video-surveilled parking. 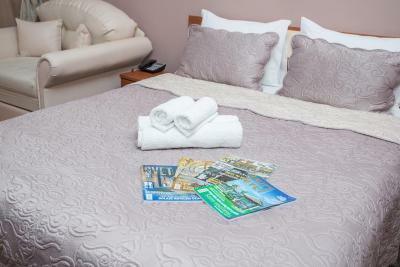 All rooms are air conditioned and have satellite TV. Sin-Kom is a 20-minute drive from the Temska Monastery. The town of Bela Palanka is 30 minutes away by car. 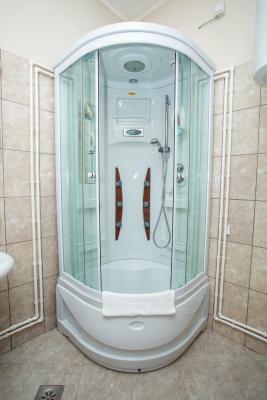 This property is also rated for the best value in Pirot! Guests are getting more for their money when compared to other properties in this city. 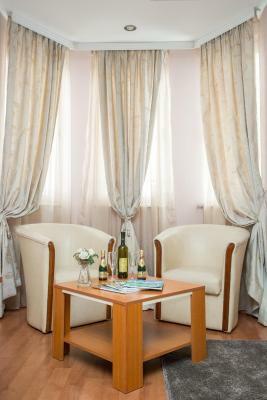 When would you like to stay at Sin-Kom Hotel Garni? All rooms offer air conditioning and facilities such as: satellite TV, Wi-Fi and a direct phone line. 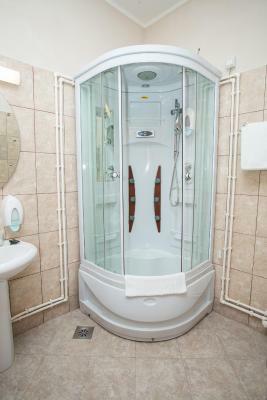 This spacious room comes with a mini-bar and a safe. 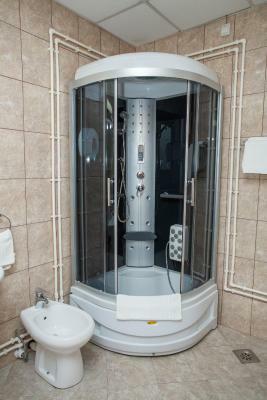 There is a spacious private bathroom included. In 2009, this place begun working as a newly built facility. 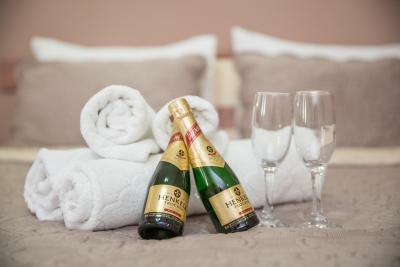 Impeccably clean and delightfully decorated rooms – this is what separates us from the others and what is our imperative. 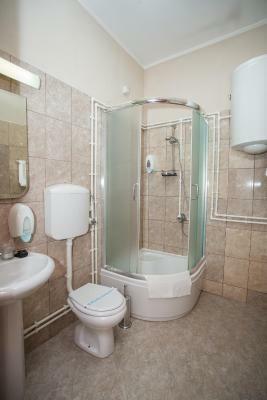 We are cleaning the rooms and changing the towels on daily basis. 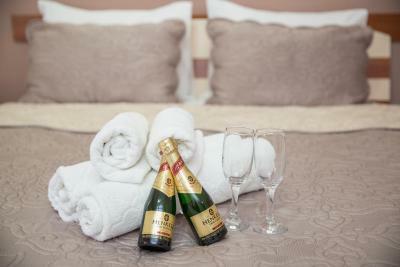 House Rules Sin-Kom Hotel Garni takes special requests – add in the next step! Sin-Kom Hotel Garni accepts these cards and reserves the right to temporarily hold an amount prior to arrival. Steep flight of stairs to get to the hotel, 1st floor. Blinds on windows meaning if the window was open it did not keep out the light. Centrally linked AC units, so once set to heat you cannot cool your own room or vice versa. 5 - 10 minutes walk from the centre. 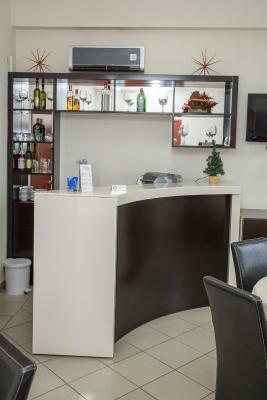 A few good restaurants within minutes, cooked breakfast reasonable quality, parking at rear, safe area. 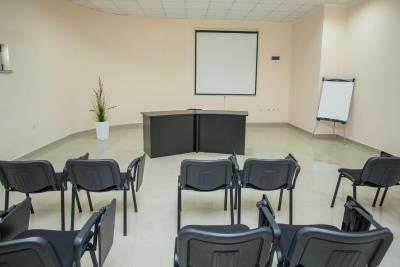 Staff very helpful, hotel in good condition, room had plenty of space, everything worked. Nothing to be mentioned - all's very good! Outstanding courtesy of the personnel. Great position. Top-notch value.. Early morning /8.30 a.m./ somebody from the staff took a decision to clean with vacuum close to the door. Friendly staff. Very comfortable bed. Big room. Great value for the money. It was a bit noisy. Be sure to specify you need non smoking rooms. 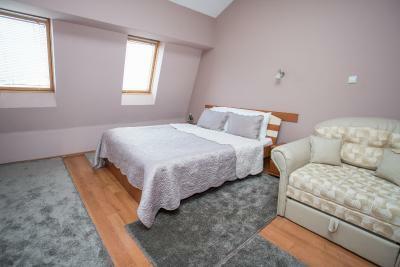 Good location, within walking distance of the city center. Good restaurants near the hotel with delicious food. Close to the city markets. Parking space available. Friendly personnel. Good breakfast. It was very very noisy, Saturday morning. The staff is starting to prepare breakfast room around 6 a.m.it was not possible to sleep after this hour, tables reorder, talking laud, it was not necessary to do this at 6 a.m. on Saturday! We were staying with my family and we were separated on different floors. Single bed is kind a small.